It’s important for you to visually realize that every email that goes to your Mailbox server must go into a database, and this creates challenges because of the huge variety of messages Exchange handles. From the tiny on-line emails to the monster MB emails with video attachments. The I/O profile of a Mailbox server is not predictable (RANDOM). Read/write that occurs between memory and disk is substantial. At times there may be waves of messages, other times may be idle. Exchange uses the Extensible Storage Engine (ESE) database engine (MS has mentioned moving this to SQL but that has been determined to be too much of an investment, so ESE remains in Exchange 2010). The ESE engine has received some enhancements to improve I/O by 70% (meaning, Exchange 2010 can read/write emails to disk 70% faster than 2007 using the same engine). These improvements included increasing the page size from 8kb to 32kb, storing header data in a single DB table, and compressing attachments. In turn, because of these optimizations, you actually have more options for using lower-end disks for your Exchange server. The idea behind SIS is when a message is sent to a bunch of people (perhaps with a large file included) the original message is stored once. 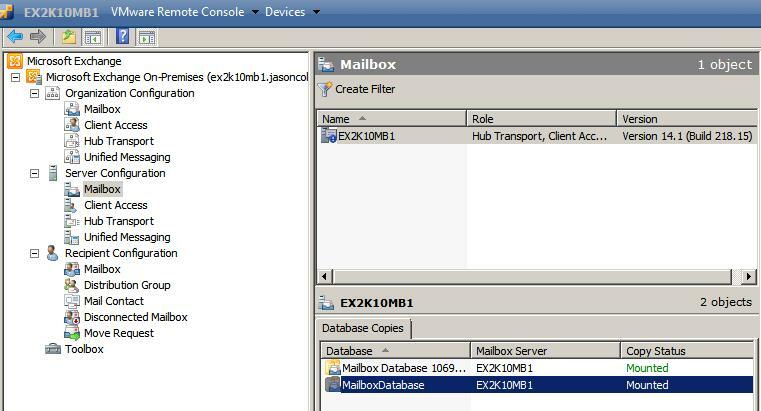 In the Exchange Management Console -> Mailbox server role -> Database Management tab, we can see the database file path and where the Transaction Logs are located. In the Mailbox Database folder on the hard drive, in the transaction logs, when the placeholder E00 log is complete, it will be renamed. For an existing DB, you can “Move Database Path” at any time and change the default locations for transaction logs and database file location. We will touch upon Journal Recipient later. Here the Exchange Mailbox Database Maintenance Schedule can be adjusted or Customized. By default, from 1am to 5 am, these tasks above are completed. An online defragmentation process will be run to free up pages in the database at the end of every maintenance schedule. This is done to reduce the amount of I/O. Legacy versions of Exchange would do a DB check-sum and look at every page to see if there was corruption at end of maintenance schedule. However, ESE Scanning does the DB check sum process for corruption on the fly, outside of the maintenance schedule. Un-checking the option for ESE 24/7, the defrag will still take place at the end of the scheduled maintenance. By default, every day at 1am if the user hits these limits, they will be sent a notification that their mailbox has gotten so large that they will either be prohibited to send or send and receive. In summary, there is a lot to consider when managing an Exchange database. We talked about the concept of an Exchange Database, Transaction logs and database files, mounting/dismounting databases, best practices for configuring DB’s and logs, and finally, maintaining our databases with best practices. In this post we will review the overall purpose of the Mailbox role. As you can tell that the role is an important one and that High Availability and Site Resilience is a key concern and Exchange 2010 has been designed specifically to provide those features. The mailbox server has quite a bit of connectivity to all the other server roles (except for the Edge Transport Server). Most of the configuration work is being done on the Organization Configuration side. In Exchange 2007, Database Management was under Server Config – related to storage groups. Very limited settings including MRM schedule and a view of Database Copies (if any exist). MRM – policies to adjust for example, how long items stay in the deleted items folders in (all) user’s mailboxes. Sharing policies control how to share calendars with persons outside the organization. To manage the mailbox server, open the EMC, go to Organization Configuration -> Mailbox. You’ll notice that I have two databases. One is the Mailbox database and the other is the Public Folders database. You can right-click on the Mailbox Database and choose properties, where you will find General, Maintenace, Limits, and Client Settings Tabs. Database availability groups tab will by default not contain objects as this tab is used for High Availability/Fail-over configuration. The Managed Default Folders tab – lists out typical folders in a user’s mailbox. You can also create additional default folders. You may want to create two different Deleted Items folders. Managed Custom Folders – place a folder in User’s Outlook – for example, Archive, you can create it, and place it in this tab. 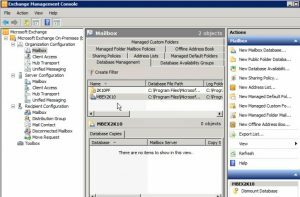 Managed Folder Mailbox Policies – no policies by default, create a policy and then apply – we will go over this later. Address Lists – pre-configured Address Lists as well as the Default Global Address List. You may want to create lists for departments, sites, organizations. In the top pane, right click on the Mailbox and click on properties. Here you will find a General tab, a Systems Settings tab, and a Customer Feedback Options. For some unknown reason, Scheduled Managed Folder Assistant tab is not available on my installation as it is in others. This may be due to permissions. By Right-clicking on the database copy, you can get the General Status of the Mailbox Database: the Content Index State, the Status (Mounted), the Copy queue length and Replay Queue Length. Under the Status tab you will find: Seeding, Messages, Latest available log time, Last inspected log time, Last copied log time, and Last replayed log time. Here you can also View Errors Messages. This post has to do with transitioning from Exchange 2007 to 2010. Essentially you will be installing Exchange 2010 on the 2007 Exchange server, setup some co-existence if necessary, transfer the mailboxes, and then uninstall Exchange 2007. – You can either deploy fresh, migrate, or transition. 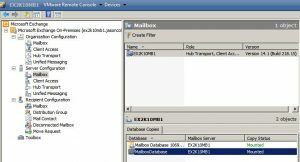 From Exchange 5.5 or 2000 to Exchange 2010 – when moving over to Exchange 2010 you will not be able to move over mailboxes or use transitioning coexistence. You might have to upgrade from 5.5 or 2000 to 2003, and then transition. Quest is a good transitioning tool from older versions to 2010. Lotus Domino has a transition path to 2007. You can run exchange 2003, 2007, and 2010 all co-existing together. Slowly move the mailboxes and public folders over. *Legacy DNS host name records: only necessary if you cannot transition quickly and need to provide remote OWA/Mobile usage. 4. Move over mailboxes and public folder data to Exchange 2010. Users trying to log into an Exchange 2010 server, but have not had their mailbox transitioned yet, will be re-directed to the previous server if the legacy A record is listed in DNS. 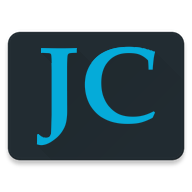 Deployment Assistant: (upgrade means transistion) -this tool can be used from the website or downloaded. Disjointed namespace: the FQDN of a server does not match the domain of which it is a member. Generation server should now be your new 2010 server. Go to Toolbox – Public Folder Management Console – should connect back to your 2007 exchange server. Give it a name (2K10PF) -> Next -> New -> Finish. Change “Use public folder database replication schedule” to Run Every Hour. Now you can remove 2007 replicas. Make sure you have complete all public folders. In the EMC Toolbox is the Exchange Best Practices Analyzer – use it! We have ended the period of coexistence, and have transitioned over to 2010.